Last year, I wrote a blog entry detailing my preference for using my Blackberry in the field. In that post, I highlighted the number of smartphone’s features had that came in handy (3.2mp camera, geotagging capabilities, compass navigation, Google maps, the ability to upload and email, blah, blah, blah…). This article from the University of Cincinnati discusses the implementaion of iPads into the data collection process at a popular Roman site. New technology is revolutionizing the precise recording of history at an ancient, lost city, bucking a tradition that has been in place for centuries. University of Cincinnati researchers will present “The Paperless Project: The Use of iPads in the Excavations at Pompeii” at the 39th annual international conference of Computer Applications and Quantitative Methods in Archaeology (CAA). The conference takes place April 12-16 in Beijing, China. The iPad research experiment, led by Steven Ellis, UC assistant professor of classics, and John Wallrodt, a senior research associate for the Department of Classics, has been featured on the National Geographic Channel as well as Apple’s website. That’s after the researchers took six iPads to UC’s excavation site at Pompeii last summer. The iPads themselves were just being introduced at the time. UC teams of archaeologists have spent more than a decade at the site of the Roman city that was buried under a volcano in 79 AD. The project is producing a complete archaeological analysis of homes, shops and businesses at a forgotten area inside one of the busiest gates of Pompeii, the Porta Stabia. Through years of painstaking recording of their excavations, the researchers are exploring the social and cultural scene of a lost city and how the middle class neighborhood influenced Pompeian and Roman culture. The standard archaeological approach to recording this history – a 300-year tradition – involves taking precise measurements, drawings and notes, all recorded on paper with pencil. But last summer, the researchers found that the handheld computers and their ability to digitally record and immediately communicate information held many advantages over a centuries-honed tradition of archaeological recording. “There’s a common, archival nature to what we’re doing. There’s a precious timelessness, a priceless sort of quality to the data that we’re gathering, so we have made an industry of being very, very careful about how we record things,” explains Ellis. “Once we’ve excavated through it, it’s gone, so ever since our undergraduate years, we’ve become very, very good and consistent at recording. We’re excited about discovering there’s another way,” Ellis says. The researchers say they plan to pack even more iPads on their trip to Pompeii this June. The research project is funded by the Louise Taft Semple Fund through the UC Department of Classics. It is interesting to see these new technologies come into play within the field. I wonder if in the future we’ll see the emergence of specialized products (namely the iPad) built for specific fields. 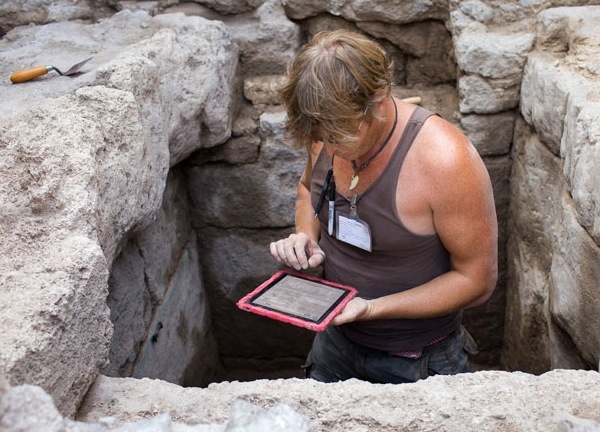 Imagine, iPad’s for archaeologists; complete with a built-in LED flashlight, a waterproof carbon fiber case, plastic port covers, laser line level, measuring capabilities. It’s an interesting idea and I think it’s something within reach.